Forensic ornithologist Pepper Trail has been investigating the apparent rise in a black market trade for chuparosas: love charms made with the bodies of dead hummingbirds. 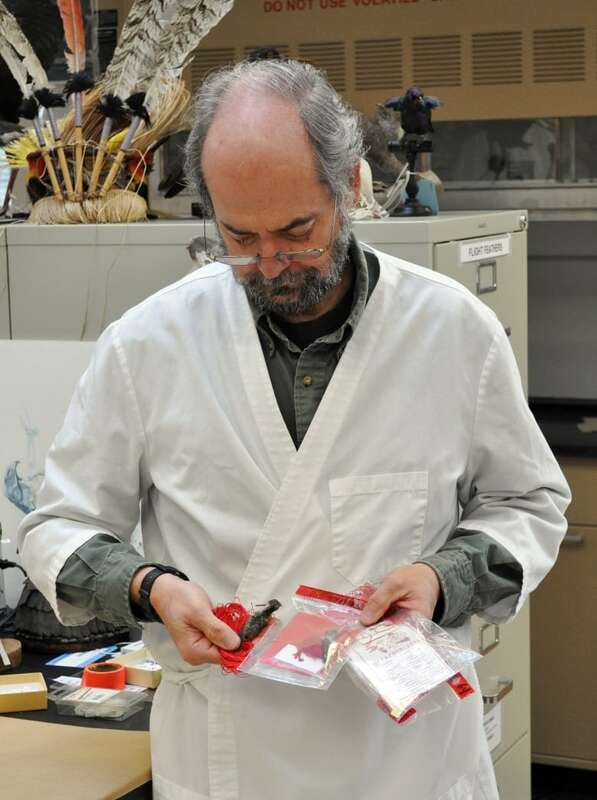 Forensic ornithologist Pepper Trail has been haunted by an unusual case that began in 2013 when a box full of dead hummingbirds arrived in his Ashland, Ore., lab. 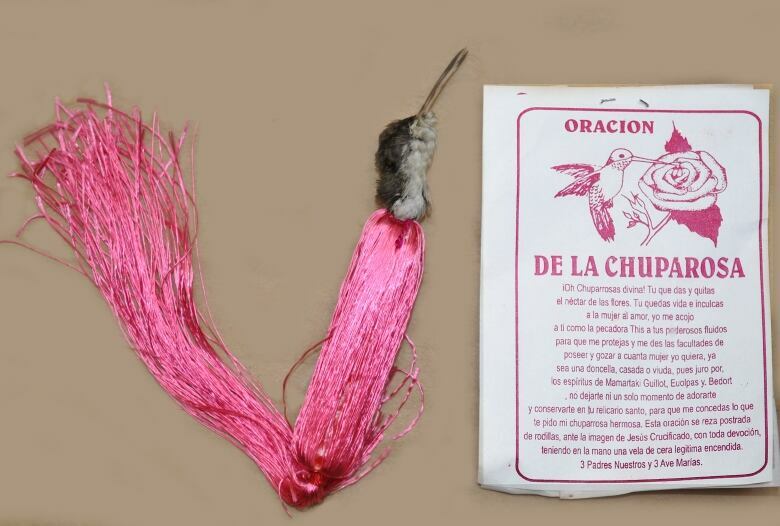 There were about 70 of them — carefully dried, dressed with red satin threads and packaged with a Spanish prayer printed on a tiny strip of paper. 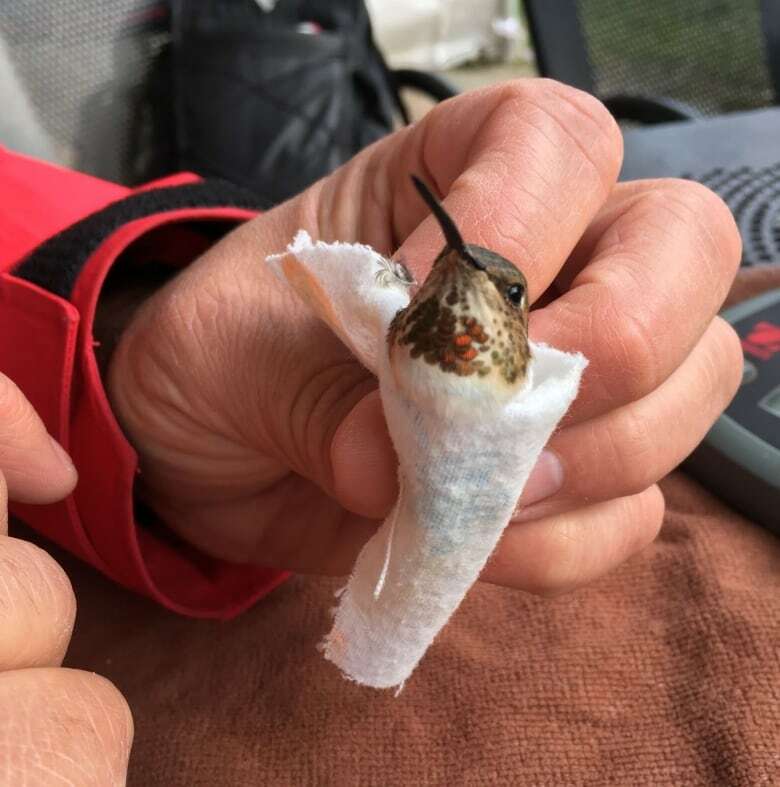 "These were intact, dried bodies of hummingbirds — the whole body," the researcher and bird enthusiast told The Current's Anna Maria Tremonti. "I had no idea what I was looking at or what the background of these was." It turns out they were love charms smuggled in from Mexico. Hummingbirds have been associated with love in cultures going all the way back to the Aztecs. While the Spanish word for hummingbird is colibri, the charms are commonly referred to as chuparosas, which roughly translates into "flower licker" or "flower sucker," according to Trail. The birds were collected by special agents with the U.S. Fish and Wildlife Service. 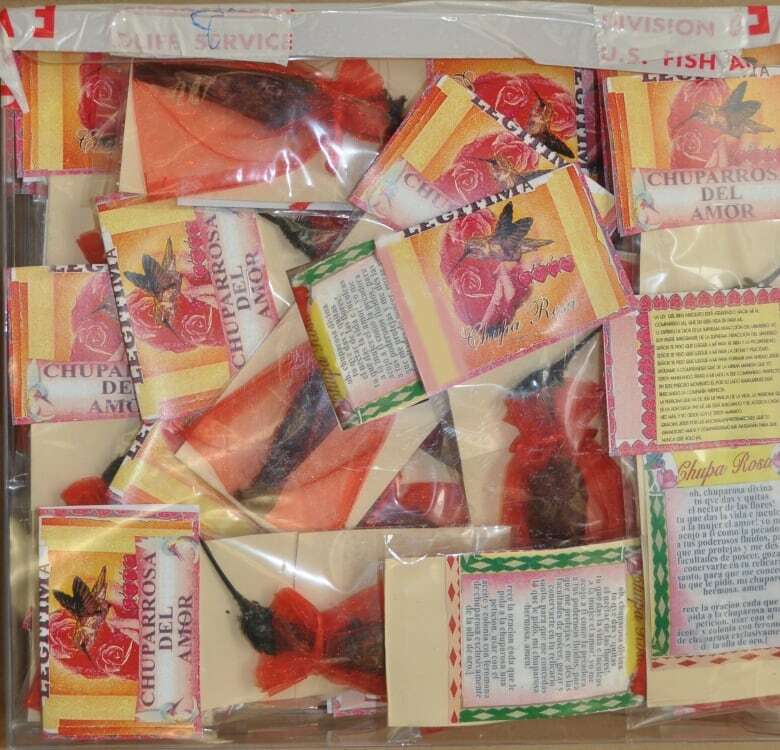 Trail and the agents have since been at the heart of an investigation into the growing black market of these charms, which has apparently found buyers in Hispanic communities all over America. The wildlife service had good reason to come to Trail for help. As one of the only forensic ornithologists in the world, he is often tasked with identifying birds' remains to figure out whether their deaths can be connected to criminal activity. He's been a part of hundreds of investigations and even testified in federal court as an expert witness. He's known by some as the Sherlock Holmes of bird crimes. As far as Trail can determine, the charms are produced in Mexico and find their ways into barrios or traditional medicine shops in Hispanic communities around the United States. The chuparosa trade is illegal in "several different ways, potentially," he said. "All hummingbirds as a group are protected by an international treaty called the Convention on International Trade in Endangered Species, or CITIES," he said. "So they're all protected by that and therefore to cross a border with hummingbirds, living or dead, you need to have paperwork that permits you to do that. And of course none of these are coming in with any kind of paperwork." In addition, about 70 per cent of the chuparosas he's seen were made from hummingbird species protected under the U.S. Migratory Bird Treaty Act. According to a National Geographic report, researchers surveying Mexico City's Sonora market in 2009 documented more than 650 dead hummingbirds for sale. The birds were prepared with a variety of methods, some linked to cultural traditions or rituals likened to witchcraft. Some were wrapped in the photographs of loved ones, or dressed with the perfume of a potential lover. Others are poured with honey or sprinkled with flower petals and spices. "The hummingbird is a bird of love," a vendor in the Sonora market, told The Current through a translator. The Current agreed to withhold the vendor's name out of concern for his personal safety. "If we have a special person that we want to attract, then we write the name of the person on the paper, put it in [a small red] bag with the hummingbird, and wear it around the neck." Dead hummingbirds cost 80 pesos, but it will cost 290 pesos, or about $20 Cdn to turn it into a fully prepared chuparosa. It's difficult to determine just how many chuparosas are making it it to the U.S., but the vendor said demand is rising. "Before, it was a lot of young people. Now it's all ages. There is such a lack of love that everyone wants the hummingbirds: young and old, both men and women. Before it was almost exclusively women," he said. 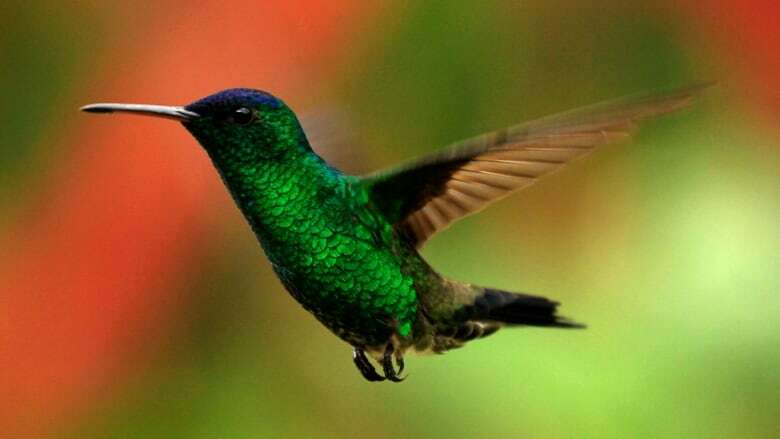 Jean-Jérôme Baudry of Consejo Cultural Yoruba, a Toronto group that promotes awareness of Latin American spiritual belief systems, said hummingbirds are considered to have a close connection to the spirit world, and as such are highly valued for various rituals. They're used as a key ingredient or offering, he said, to allow spirits "to essentially, for lack of a better word, walk the Earth and interact with this realm in a more direct fashion." Trail said the charms' uniformity — all the prayers are printed on paper, the packages have "Made in Mexico" stamps — means it's likely they are being mass produced. "It suggests that this is a pretty well-organized operation," he said. "It's not just village boys going out with slingshots and getting a few birds." By using X-rays to examine their bodies, he discovered that somewhere between 20 to 30 per cent of them had been shot. 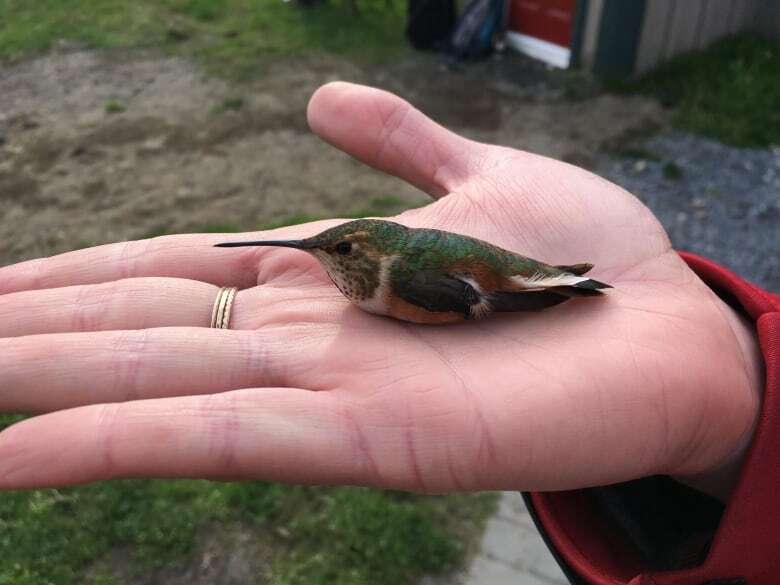 "I can only imagine it's very difficult to shoot a hummingbird, but there's a very, very fine bird shot almost as fine as a poppy seed," he said. Others appear to have been caught in nets or trapped with birdlime, a sticky substance spread around places the birds feed. Hummingbird populations — including the rufous hummingbird, one of the most common types in Canada — are declining around the world. It's happening because of a myriad of reasons from climate change to the rapid urbanization in areas where they breed. Baudry was skeptical that a surge in the chuparosa market might also be contributing to their decline. "I have far, far, far more concerns about the stresses on the ecosystem and the disappearance of entire species of ecological neglect and disregard than I do from religious practices," he told The Current. Trail agreed that the "highly selective use," as he called it, of hummingbirds to make love charms might not be as significant as the other factors whittling away the hummingbird population. "I understand the special feeling that people have about hummingbirds. They are extraordinary, and I understand why there are beliefs that are associated with them," he told Tremonti. "It would seem possible to me — and maybe it's culturally naive — but it would seem possible to celebrate their special qualities without killing them. I would hope that that would be possible." Listen to the full conversation near the top of this post. This segment was produced by The Current's Jessica Linzey.